When it comes to disability support care, it is common practice to assume that it is the carer who supports their patient. However, for Silvia Gall and Matthew Reynolds that role has been shared by both carer and patient. 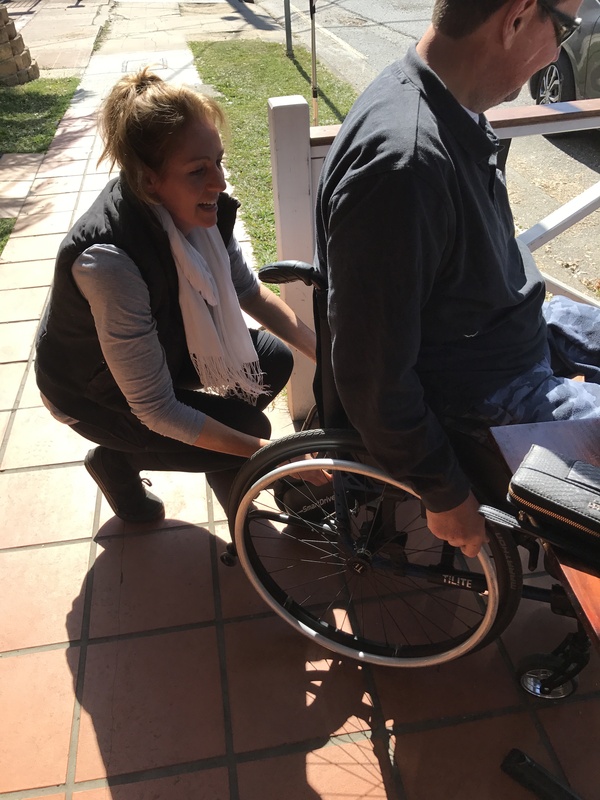 When I first sat down with Silvia and Matthew, it was clear that their relationship went beyond the typical carer and patient dynamic. As I watched them laugh and steal food from each other’s plates, there was no doubt they had formed a strong friendship over the past five years together. While Matthew said he was friends with all of his support workers, he admitted that he was definitely closer with Silvia. 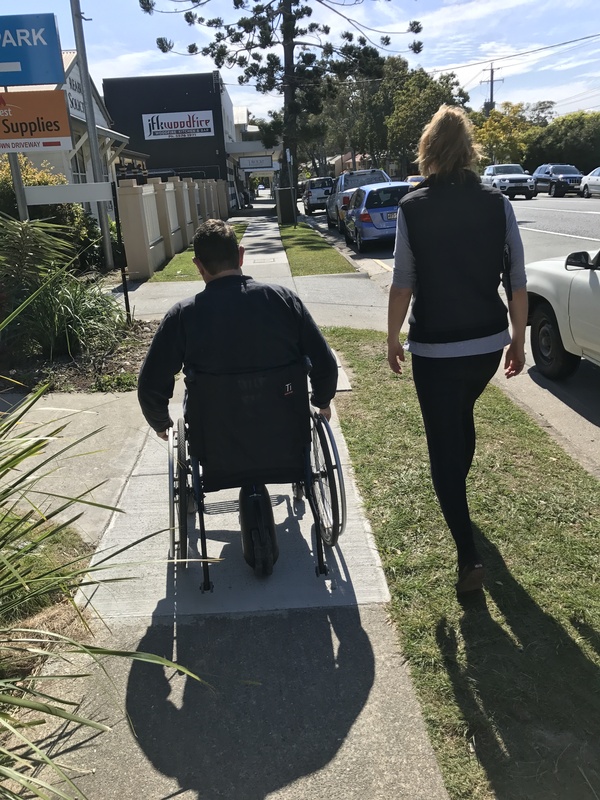 It is not usual for agencies to allow support workers to work regularly with the same client, however Spinal Life Australia believes a personal touch is vital in this profession. Many agencies rotate the carers and clients all the time, which Silvia said makes it seem like more of a job. 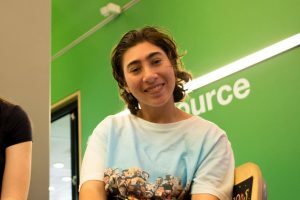 “We’re very lucky to be able to have the same client over and over, because you create a bit of a rapport and get used to their routine, which is absolutely important,” Silvia said. However, support care is not always easy. When Silvia and Matthew first met, both were tackling their own difficult circumstances. Matthew hasn’t always been paraplegic. It wasn’t until 2010 that his life was turned upside down. Following a stroke at work, Matthew was rushed to hospital and spent thirteen hours on the operating table, where doctors worked to save his life. 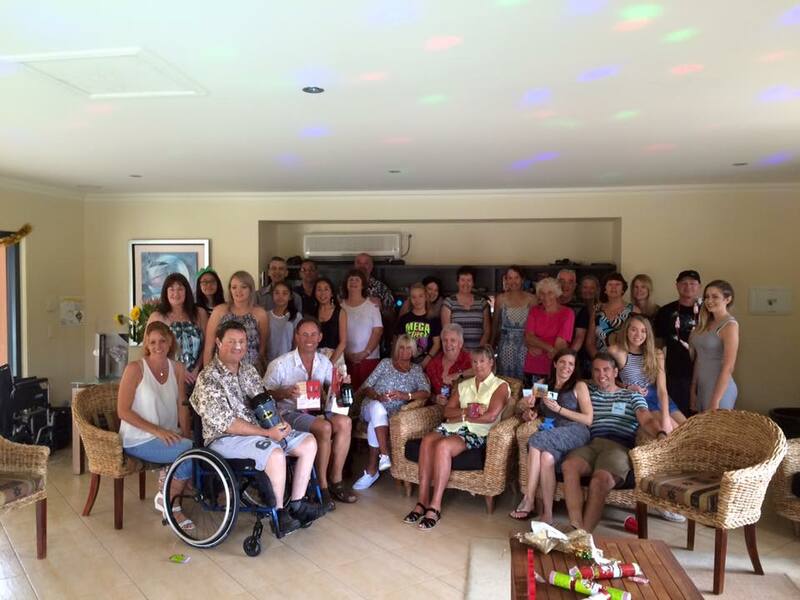 It was on that table that a lack of oxygen to his spine led to him becoming a paraplegic. Matthew explained that only 5% of people who endure what he did, survive. “I’m the only one in the PA hospital at that time that survived this procedure,” he said. 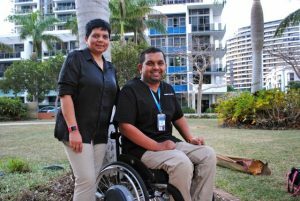 Both Matthew and Silvia agreed that it was not until his wife left him almost five years ago that he started to accept his physical impairment and learn to function on his own. “It was like he was numb and totally in shock during that time and because his wife was there to do all of it for him, he didn’t have to come out of it,” Silvia said. A short time later the pair were introduced however Silvia was also facing some difficult decisions in her personal life. After working with an exhaustingly difficult patient for the first time and dealing with the added stress of her marriage ending, Silvia was ready to throw in the towel altogether with support work. But then she worked with Mathew. Reminiscing on that first day, Silvia began to get emotional. Tears began to fill her eyes and her voice broke as she recounted that difficult year. 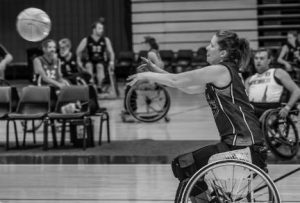 “The main reason I stayed with Spinal Life was because of Matt,” she explained in a shaky voice. “He was so understanding of everything and so consistent. He was never angry, nor was he ever ungrateful. “He is just so consistent, really steady and all through the first year of my separation, I was able to just go there and just…” Silvia trailed off as her voice broke with emotion “…he pretty much helped me as much as I helped him,” she finished, wiping the tears from her eyes. 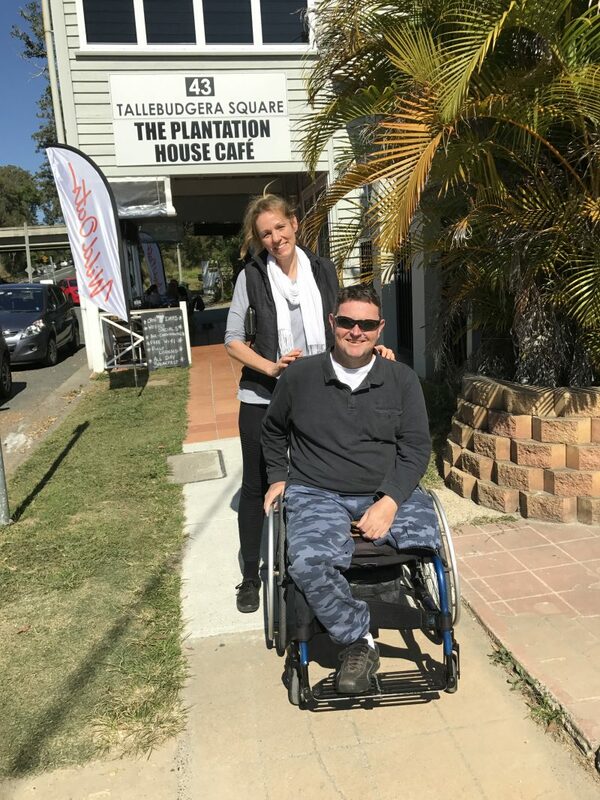 Over the next five years, Silvia continued to work as Matthew’s support carer, while he continued to support her with his unwavering friendship. Not only did Matthew have such a positive impact on Silvia’s life, he also impacted her daughters’ lives significantly. Gabrielle Gawthorpe and her sister Jessica Gawthorpe, grew up having Matthew as an integral part of their lives. “He has shown me that even though life gets hard and continues to put you down, you can get through anything,” Gabrielle said. Silvia said that having Matthew in her daughters’ lives helped shape them into the women they are today and taught them to look beyond someone’s disability and focus on the person instead. “I think it’s really good for them to realise that even though there’s a chair, he is still a normal person. He’s just like you and I, but sitting in a chair. He’s doing life sitting down basically!” she laughed. Unfortunately, the last five years also brought some difficult times for Matthew. When Matthew went to roll his chair over the lip of the carpet at a country pub, he found himself toppling backwards. All it took was one inch of vinyl for Matthew’s life to drastically change, resulting in a seven-week hospital stay and a fractured spine. While no one could have anticipated it happening, Silvia still holds herself responsible for what happened that day two years ago. “I feel like I should have been on the ball more. It’s such a simple thing that could have saved a whole year of his life,” she said. As she said this, Matthew was quick to comfort her with a light-hearted joke and take the blame for what happened. Even after losing his leg to a burst femoral artery, Matthew’s resilience remained strong. “I lost my leg but getting in and out of the car is a lot easier now!” he joked. While Matthew manages to stay positive most of the time, he admits it’s difficult being admitted to hospital for things that many would consider as trivial. “It really does your head in,” he said. Over the years, Silvia has supported Mathew through every hospital visit and always notices a shift in his usual positive attitude. “Mathew slowly disappears, he gets quieter and quieter. He forgets things because he just shuts down and turns his brain off so that he can cope with being stuck in bed every day,” Silvia said. Yet Matthew persevered and once he was cleared to leave the hospital, his mindset shifted back to one focused on living his life to its fullest capacity. As of now, Silvia said Matthew is as good as he has ever been, both mentally and physically. Although he must have regular hospital check-ups and dialysis three times a week for four hours, his positivity is un-wavered. When Matthew reflected on his progress, he simply said he accepted everything and moved on. “Make the best of what you can. There’s no use getting bitter and twisted, that just makes you sick and pushes people away,” he said. One thing is for sure though, Silvia and Matthew will remain lifelong friends, regardless of whether Silvia continues as his support worker in future years. The pair have become inseparable and both credit the other for the people they are today. “I couldn’t live without Silvia, it’s as simple as that. I wouldn’t be the person I am today if I hadn’t met her. She pulled me out of a deep hole,” Matthew said. “I always say he’s like the big brother I never had. I can tell him anything,” Silvia smiled. As we finished our breakfast together, I watched the duo tackle the juts and cracks in the cement path, their laughter infectious. 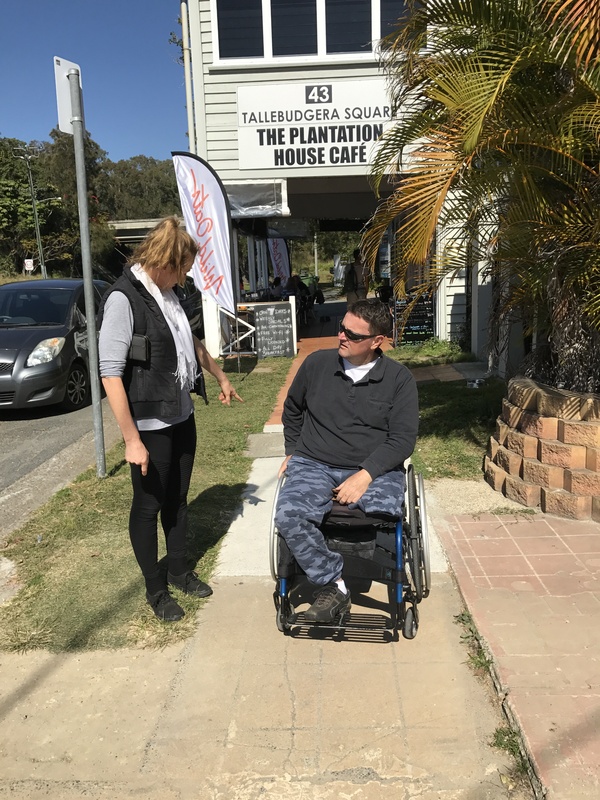 Something as simple as a badly laid concrete path posed difficult for someone like Matthew and yet he remained positive and pushed forward, naturally refusing to let his impairment affect his attitude towards life. If there is one thing we could all learn from Matthew, it is that we should appreciate the little things in life and not sweat the small stuff, because if he can find a way to push through it, can’t we all?